Hope's Relief Dry, Itchy, Flaky Scalp Conditioner is made from all natural ingredients that penetrate deep into the scalp to soothe, moisturise and protect against dry, itchy and flaky scalps. Hope's Relief conditioner works in 3 stages: using ingredients that nourish the scalp, mildly cleanse, and anti-flaking actives all while leaving your hair soft and smooth. Free from nasty, harsh ingredients making it perfect for all in the family to use, including babies. It is ideal for scalps that are prone to eczema, psoriasis, seborrhoeic, dermatitis, cradle cap, and dandruff. Aloe vera Conditions and moisturises. Licorice root and gotu kola Soothes inflammation and itch. Calendula Antiseptic restores health to the scalp, encourages collagen growth. For dry, itchy, flaky scalps. Works with the dermal layers of the scalp. 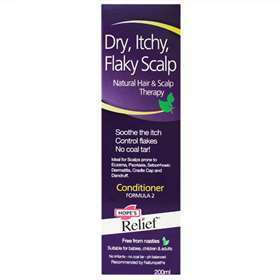 For maximum results with affected scalps use with Hope's Relief Dry, Itchy, Flaky Scalp Shampoo. Massage into wet hair and scalp. Leave for 2-3 minutes to allow the ingredients to fully nourish and treat the scalp. Rinse clean and dry gently. Aqua, Palm Glcerin, Cetearyl Alcohol, Citrimonium Chloride, Leptospermum Scoparium Mel (Manuka Honey NPA+), Aloe Barbadensis (Aloe Vera), Jojoba Oil, Calendula Officinalis (Calendula ext), Centella Asiatica (Gotu Kola), Guar Hydroxy Propyl Trimonium Chloride (plant derived), Phenoxyethanol, Citric Acid (Vit C), Glycyrrhiza Glabra (Licorice Root), Benzyl Alcohol, DI Alpha Tocpheryl Actetate (Vit E).